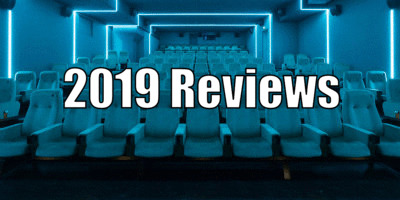 Opening with one of the most unconvincing pre-horror teaser kills I've seen in a long time, the signs were not good that this was going to be a high quality indie horror. A young woman (whose acting isn't too bad) returns home to a blonde big boobed airhead (whose acting IS bad) clutching a box containing a shrunken head exclaiming, "I know how to stop the curse." ‘Bad acting Shelby’ follows her into the lounge and before she can stab that shrunken head into forgottenville, someone in a very bad wig and fright make-up in garb from the 1800s appears behind her and uses her impressively talon-like fake nails to gouge out said not-bad-actor's eyes. This witchy creation then ‘chases’ a not particularly alarmed Shelby upstairs to do away with her as well. I think my scream of horror at the acting was more convincing than the screams of the actors on screen. After title cards we get into the thick of the story, Alice (KateLynn E. Newberry – insipid) and Lauren (Brianna Burke – captivating) go shopping at what is clearly meant to be a mystical store, though it seems to have just been set up that afternoon in an office space. The clerk hits on them when they try to buy some incense and then, when he's conveniently drawn out the back, they decide to steal the boxed shrunken head that he insists is not for sale even though it's tantalisingly perched on the front counter. Big fans of apparent online celebrity Hunter Perry (a charismatic but uneven Rob Jaeger), they show up at his house with Alice’s boyfriend Dylan to present him with the stolen head. Perry’s internet search reveals that the shrunken head’s name is Lilith Ratchet and she promises to curse whoever is holding the head once the poem included in the box has been recited. He decides this Hot Potato 'game' would be pretty awesome on his show ‘Beyond the Veil’ and so promptly buys said head from the women, ignoring the misgivings of his girlfriend Bree (Angela Cole in an appealing performance). Perry chooses a night to play the game with a group of revellers at a horror themed party being held at the ‘Rock Star Bar’ owned by Dylan. After days of promotion, it’s the big night where the audience is treated to a scene in which you see the game played over and over again, presumably to show us in what order the fodder, sorry, characters will die. After hearing that poem seven times in a row I could recite it and would myself happily curse anyone who said it again. Heading home alone, Nate, victim number one, sees Lilith and is promptly hit by a car. The next morning, when telling Lauren about how they lost "such a good guy," Alice says, "when intoxicated, people sometimes make silly decisions;" thank you for the PSA Alice! After death number two, when Alice in tears approaches her boyfriend to explain how heartbroken she is about a close friend's death (expressed in a series of grimaces and shudders, her shoulders somewhere around her ears), he proceeds to dismiss her fears, after which she leaves in a muted huff while he watches her wander off upset into the night - great way to look after each other there. They predictably band together and seek the help of an inevitable psychic but, of course, they are picked off one by one in the order in which was designated by the shrunken head game - its Final Destination, the headless edition. This was a slice of extra cheese from writer/director Eddie Lengyel, who managed to get a good looking film from a very low budget with a script that was not entirely without merit and some nice directorial flourishes - it even afforded one or two workable effects. Something I did appreciate about this film was the significance with which they dealt with each death; they weren't just lined up, killed and forgotten - most every death was mourned and an impact shown. A few of the ‘she’s behind you’ jump scares worked better than I had expected, especially given the Halloween horror mask make up that is Lilith’s face. 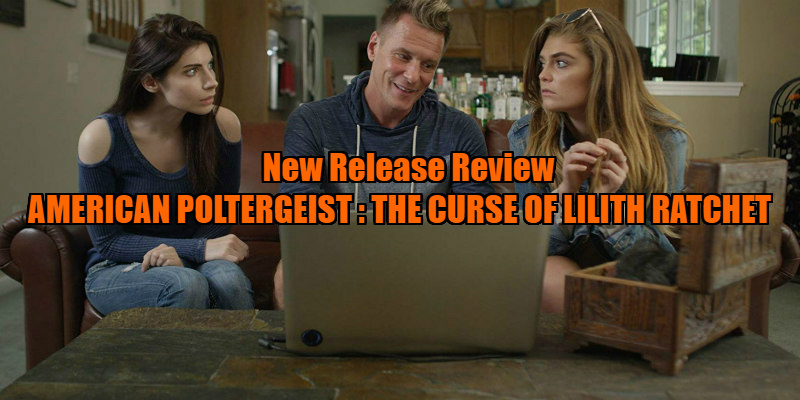 American Poltergeist: The Curse of Lilith Ratchet (the ninth in the series!) is over long and quite ridiculous but I did like the ending and it wasn't anywhere near as unwatchable as I had expected. For a so-bad-it's-good movie to keep you entertained with your buddies on a Saturday night, you could do worse. 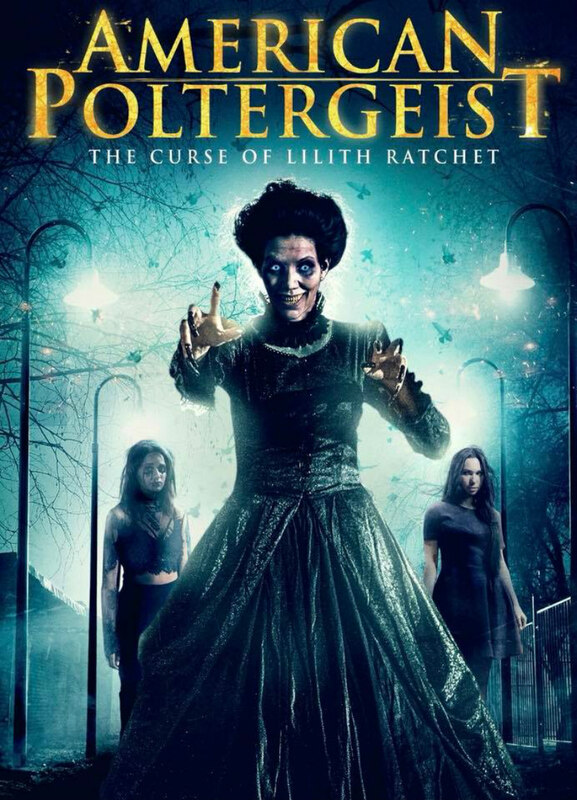 American Poltergeist: The Curse of Lilith Ratchet is on DVD now.